The new edition of MBA Kompass 2010 was published and SBS was mentioned among the top business schools in Switzerland. MBA Kompass 2010 is a supplement of Handelszeitung and io new management. 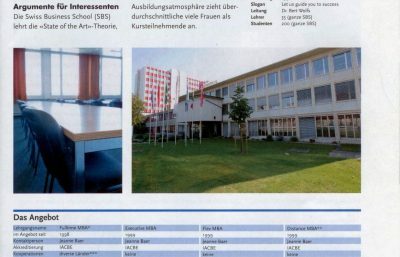 The newspaper Handelszeitung has published its yearly MBA Guide called MBA Kompass 2009. The guide gives an overview of the different MBA programs, the opinion of Swiss companies on the EMBA, Alumni Clubs and listings of the key important MBA schools in Switzerland.